Yesterday, I received an e-mail from Phil Southerland (pictured to the left with his mother, Joanna), who in case you didn't know it, bicycled across the U.S. last year to raise money for the Juvenile Diabetes Research Foundation. 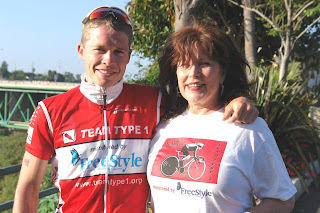 Team Type 1, founded in 2004, was the dream of two young men with Type 1 diabetes, Phil Southerland (diabetic since 7 months of age) and Joe Eldridge (diabetic since 14 years old). Anyway, Phil and his team have decided to do the trek cross-country again starting tomorrow, and their goal is to complete the trek in a record 5 days and 6 hours! If they accomplish this, they will have broken their own world record which they accomplished last year. I personally support these guys, and although I believe there are enough cheerleaders for people with diabetes, Team Type 1's efforts to raise awareness and their fundraising deserve far more credit than they have received. Even small donations are valuable, if for no other reason than to demonstrate your solidarity with these guys. You can follow the progress during the next week on the Team Type 1 blog and contributions can be made here. "Not a chance. We will have Team Type 2 beginning in 2008. I am looking for any Type 2's interested in being inspirational, and competing in RAAM!!!" I wish Team Type 1 the best of luck for a very worthy cause! The text of the e-mail I received can be seen below. 3. Raise some money to one day cure the disease. TT1 riders will be participating in JDRF ride to cures. Right now we are on pace for $130,000. 4. 3053 miles in 5 days and 6 hours. We can use YOUR help. If possible, please view the race blog on www.teamtype1.org. We will have photos and stories posted during the race. 2nd, please tell your friends, and people you know about the team and the race. You may just help someone to get excited about a new challenge. Lastly, donations, which will help further research of this disease. To follow the team, there is www.teamtype1.org (please visit to view all of our sponsors who make this dream possible) as well as www.abbottdiabetescare.com (our title sponsor, and reason for doing the race,) and www.raceacrossamerica.org. Thank you so much for your support. We all look forward to hearing from you on the road! Participating in this sort of glitzy production in the name of a cure in reality dismisses all of the hardships being experienced in the diabetic community—with no true help for the diabetic UNLESS it benefits diabusiness (industry & charity). For example, the expressed goals of 6.3 A1c is more aligned with promoting all of today’s high technology—problematic pumps, inaccurate meters, “better” insulin protocols, “new” specialty foods. 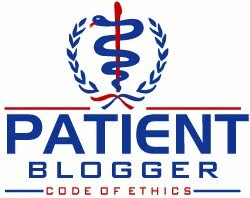 The corporate “sponsors” of these endeavors are only interested in increasing corporate profitability; if patients benefit along the way, to some small degree, it is merely a fortuitous coincidence. Many long-term diabetics I know could tell you that until the late 1980s they could maintain EQUAL or BETTER control than now—with none of the high tech gadgetry and “better” insulin products. Understand, the underlying rule in corporate America is “give them less, tell them it’s ‘more,’ and keep counting the dollars.” The sooner ALL diabetics understand they are nothing more than diabusiness PAWNS, the sooner we will unite and demand a CURE—charities be damned. The fact that these 8 young people achieved such a ‘lofty’ goal, a world record, is worthy of recognition. But the fact that JDRF exploits the achievement (and the disease) to inflate their coffers is despicable. In more than 35 years, the parents of diabetic children who founded JDRF to seek a cure, still see their diabetic children (now 35 years older) waiting for a cure that remains 5 years away. Instead of allowing themselves to be exploited, these young diabetics have a (fleeting) bully pulpit from which to speak. They could express how difficult it is to live with this dreadful disease 24/7/365. They could let the (non-diabetic) public know that ‘treatment’ is more than “take a shot and stay away from sweets.” Instead, they seem to revel in their “15 minutes of fame.” As they perform their spokesperson duties, they seek to homogenize us—if we follow their example, if we keep our numbers good enough, we, too, can succeed. We’re INDIVIDUALS; we need advocates, not corporate or quasi-corporate propagandists, to speak for us. Sorry, but my ADA contributions ceased many years ago. I fear JDRF contributions are also at an end. As I see the obscure avenues being explored by JDRF researchers—funded under the umbrella of “cure research”--I have become increasingly skeptical about how wisely my donations are being spent.